I use carrot a lot, but never came up with an idea of using it to make buns until the day before yesterday. 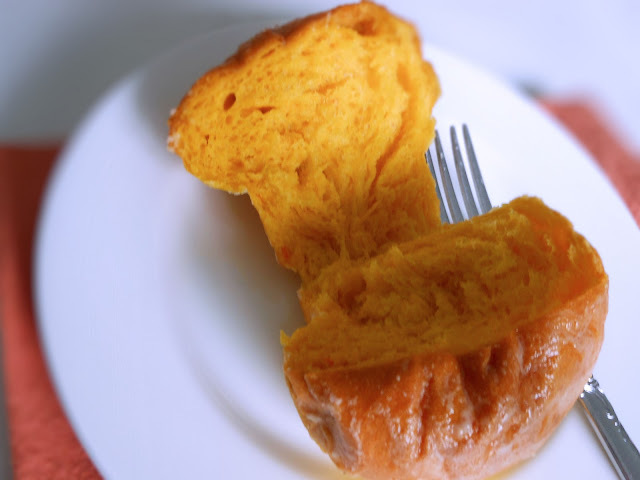 As my skill in bread making has already been to my standard, I was quite confident that I could create a good carrot buns recipe. Besides using most of the basic bread ingredients, I added pureed carrots to the ingredients. I substituted honey for sugar. The steps are basically the same as other bread that I follow. I was full of joy when I saw those buns come out so fluffy from the oven. 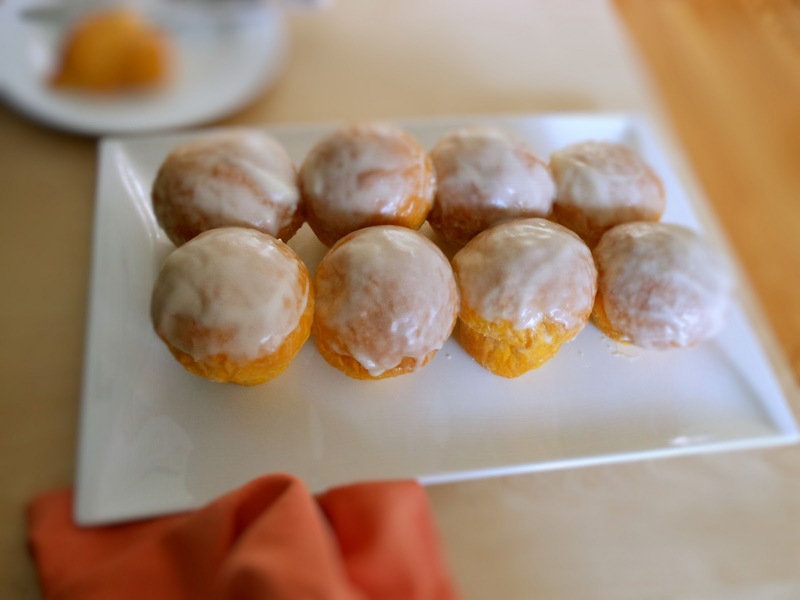 With the glaze on top of the buns, it gave the buns a rich, buttery taste. For pureeing carrots: Peel and chop two carrots (about 7 1/2" long each). Place carrots in a small pot and cover with water. Bring to a boil. Reduce heat and cook for 15 to 20 minutes or until tender. Drain well. Using a food processor, puree the carrots until smooth. For butter glaze : Mix 1/4 cup butter, 1 cup icing sugar and 1/2 teaspoon vanilla extract together well. Mix 1 teaspoon of sugar with 1/4 cup of lukewarm water. Add yeast to the water and stir to dissolve. Let stand for 5 minutes or until foamy. In a bowl of a stand mixer, using a flat paddle attachment to beat butter or shortening until creamy. Add egg, pureed carrots, honey, skim milk powder, and salt to the shortening and continue beating at medium speed until smooth. Switch to a dough hook. Add 1/2 cup of flour at a time to the mixture and mix it at low speed until 2 1/2 cups of flour are finished. 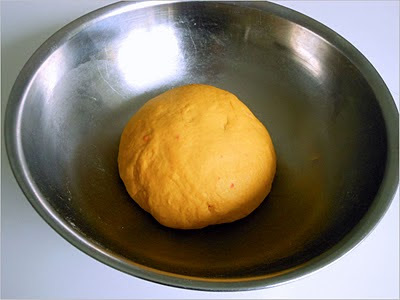 Turn up the speed to medium and knead for about 8 to 10 minutes or until the dough is nicely formed. Let rise until the dough has doubled in bulk. 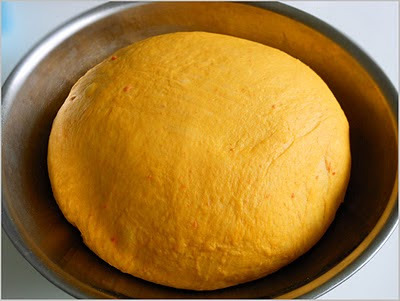 Put the dough onto a floured surface and divided into 12 pieces. Roll each piece into a ball. 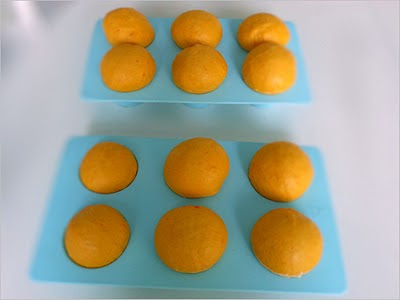 Place the dough into each greased muffin cup. Cover with plastic wraps. Let rise until double. Bake at 350 degrees F for 15 to 18 minutes. Dip the top of the buns into the glaze and place the buns onto a plate.